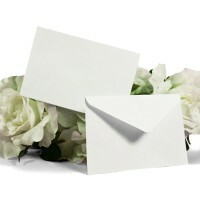 Memo cards for use with floral arrangements, gift baskets or as gift tags. High quality single card that says, "Happy Birthday" across the top in shiny red letters with a row of colorful birthday gifts across the bottom. The back of the card is blank, so additional comments can be written. 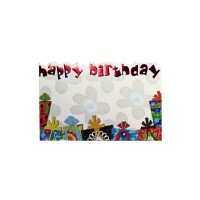 Happy Birthday Memo Cards (Pack of 50)(Click image to enlarge.) 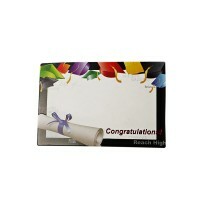 Size: 2-1/4" H X 3-1/2" W ..
Congratulations Diploma Memo Cards (Pack of 50)(Click image to enlarge.) 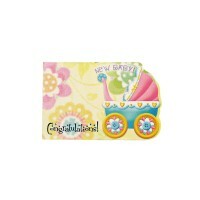 Size: 2-1/4" H X 3-1..
Congratulations New Baby Memo Cards (Pack of 50)(Click image to enlarge.) Size: 2-1/4" H X 3-.. 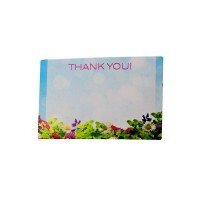 Thank You Memo Cards (Pack of 50)(Click image to enlarge.) Size: 2-1/4" H X 3-1/2" W Thank..
No. 80 Memo Card Envelopes 3-5/8 X 2-3/8 (Qty of 50)(Click image to enlarge.) Size: 3-5/8" W X..